I wish there was a superman theme in the same style! sweet theme. hey can you install intense debate for your comments or something plz. Who’s the artist that did this drawing? I love it! 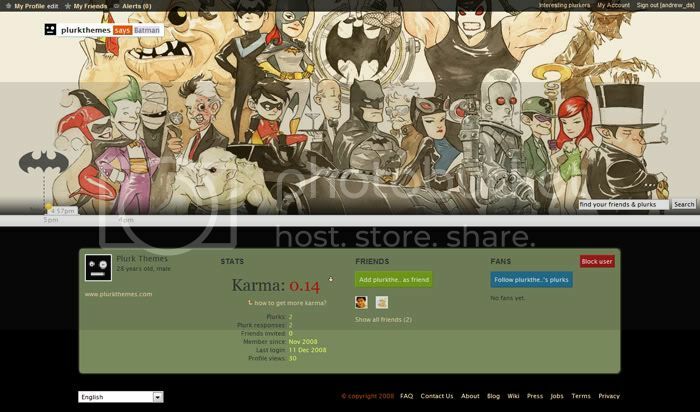 i love it too,but it’s still have some problem,if there’r some on post the new plurk or response your plurk,this theme won’t remind you to notice. are there some bugs in this theme? This theme is super cool. I love the background picture. Where did the artwork come from? I would love to make it a desktop or otherwise. It’s amazing. i used this. thanks, very pretty. This wonderful art is drew by Dustin Nguyen. He is a great Batman comic artist. How can I use this theme? how can i install this one? please help! how to use it??????? ?please help me!! I wish there were a Flash Family + Rogues Gallery layout like this!